My husband and I have hung out for a long time: we dated for 8 years and have been married for 20 years. Early on in our relationship, he introduced me to his family’s mostly-annual tradition of making German sausage. I do not remember the year I was first invited to join in the tradition, but I do remember being amazed, and maybe even a little shocked by the process. Although I too was a farm kid, I had never thought about how the sausage that I ate was actually made. The event took place at his parent’s house and I managed to avoid participating up until it was time to weigh and package the newly ground sausage. Someone handed me a big stainless steel bowl of fresh sausage and instructed me to start weighing and packaging the sausage in one-pound packages. Being a teenager, and new to the family besides, I felt like I had no other choice than to roll up my sleeves, wash my hands in bleach water, and get started. 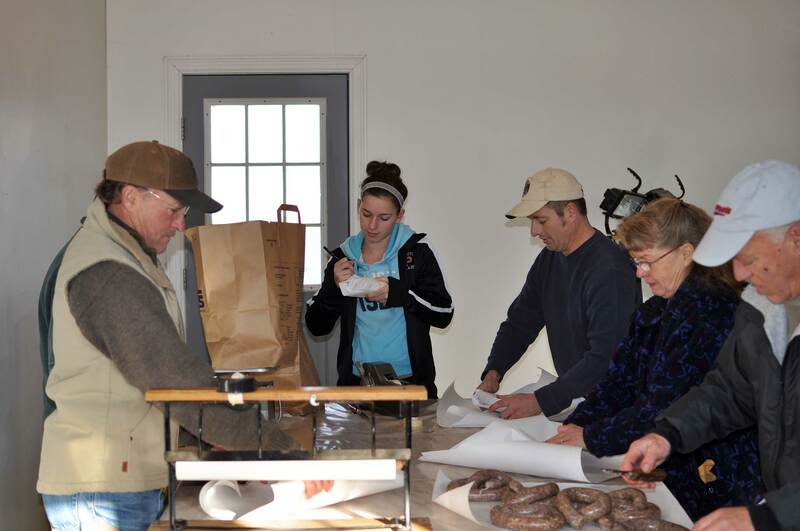 The sausage-making tradition has continued through the years, taking place in different locations and with different combinations of family members in attendance. The equipment has been upgraded, the recipe is always being altered/improved, and the process continues to be refined. Over the past several years, we have hosted the event at our home on the day after Thanksgiving. We choose this weekend because people are free for the holiday weekend and the temperatures are typically cold enough that we do not have to worry about keeping the meat cold throughout the process. Although I am unsure how far back this family tradition dates, I know it goes back at least to my husband’s childhood when they used to make sausage at his grandma and grandpa’s farm. The recipe is of German origin, but has been changed over the years based on available ingredients and in response to discussions about possible improvements. One thing has remained the same however, this family knows how to make good sausage. We hosted this family event at our house again this year. The preparation process is a long one and requires completely cleaning out our garage, mopping the floors with bleach water, hauling equipment in from various storage locations, and setting everything up. We place clean plastic on all the tables and wipe them down with bleach water. 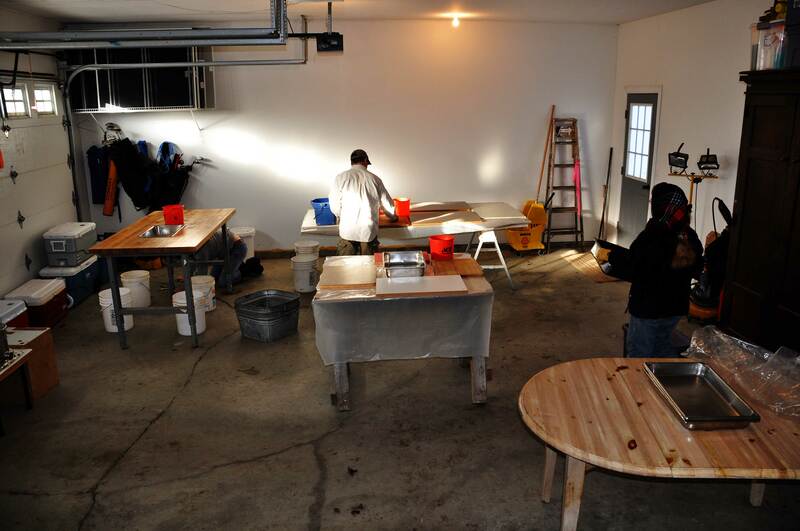 Cutting boards, knives and containers are also washed. We do all this prep work on Thanksgiving evening, so it helps us work off that big turkey dinner. In addition to the cleaning and setting up, another important preparation that we do the night before is to mix the spices. 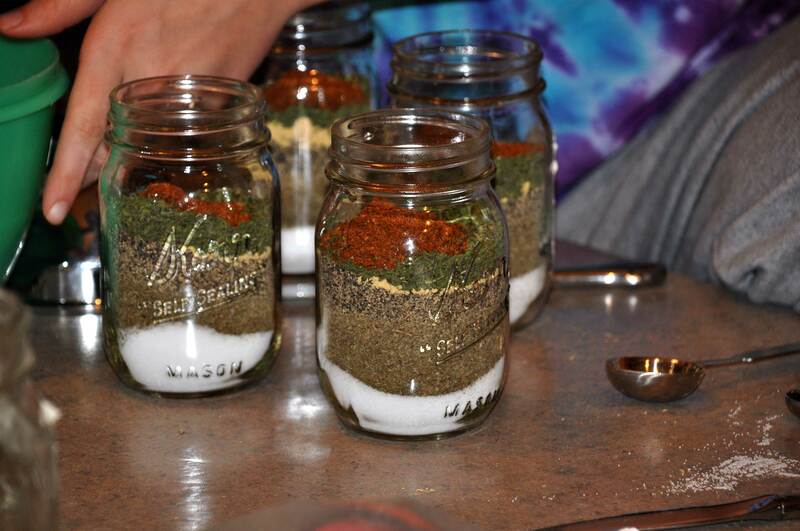 My mother-in-law purchases all the spices, mostly in bulk, and works with our three kids to measure them out into pint jars. Each jar is enough spices to season 30 pounds of sausage. 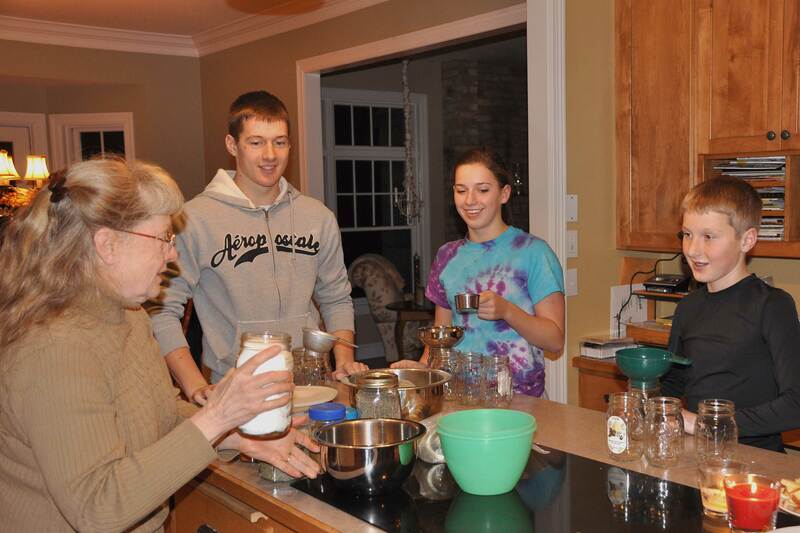 The kids stand in a line and she gives them the measurement and they pass each ingredient down the line, placing the correct amount in the jars in front of them. My mother-in-law is in charge of the recipe so I don’t know the exact ingredients, but the spices at least include various amounts of salt, black pepper, sage, coriander, summer savory, all-spice, fennel seed, cayenne pepper, sugar and clove oil. In the morning of sausage-making day, someone goes to the locker to pick up the hogs. This year we ordered 2 whole hogs, each with a hanging weight of around 220 pounds. Our oldest son and an uncle both got a deer during hunting season this year, so we purchased an extra 30 pounds of pork trimmings to mix with the venison to make sausage. Once people start to arrive, the cutting begins. The hogs are cut into sections and the people cutting are given sections from both the front and rear quarter for cutting. The idea is to get a good blend of the different cuts of the hog, mixing together both the premium and more standard meat. The meat is cut off the bone into cubes or chunks for grinding. We had three tables set up for cutting. Sausage is commonly made from the scraps and least desirable cuts of the hog. In contrast, the sausage we make is a “whole hog” sausage, which means that it includes all parts of the hog, including the premium cuts: ham, tenderloin, shoulder, etc. As the meat is cut off the bone, the chunks of meat from each table are moved over to the grinding area. A few years ago, the family purchased a 1.5 horsepower commercial grinder to improve the process. It has been a great addition to the sausage-making equipment. The ground pork is put into a tub and weighed. 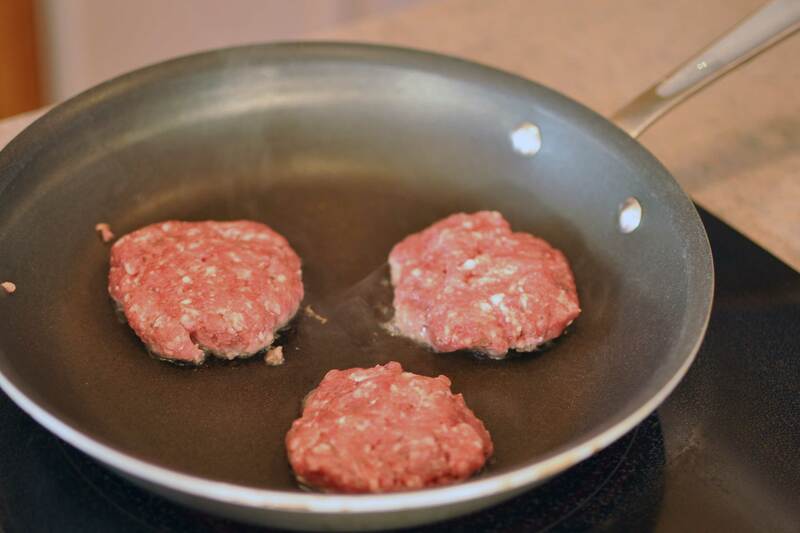 The batches of sausage we make consist of 24 pounds of ground pork mixed with 6 pounds of ground beef. Once there are 24 pounds of ground pork ready for processing, the mixing begins. Each 30 pound batch of sausage is seasoned with one of those pint jars of spices mixed the night before. A quart of ice water is also added to the mixture to add moisture and to help distribute the spices. The mixing is done by hand, usually by two brave people. The sausage is really, really cold and the spices make your skin itch and burn. There are discussions about purchasing a hand-crank mixer for next year to improve this part of the process. After the sausage goes through the mixing process, it is ready to be packaged as bulk sausage or eaten. We always try out the freshly made sausage for lunch. It’s always really yummy, even though the spices have not had a chance to fully set. 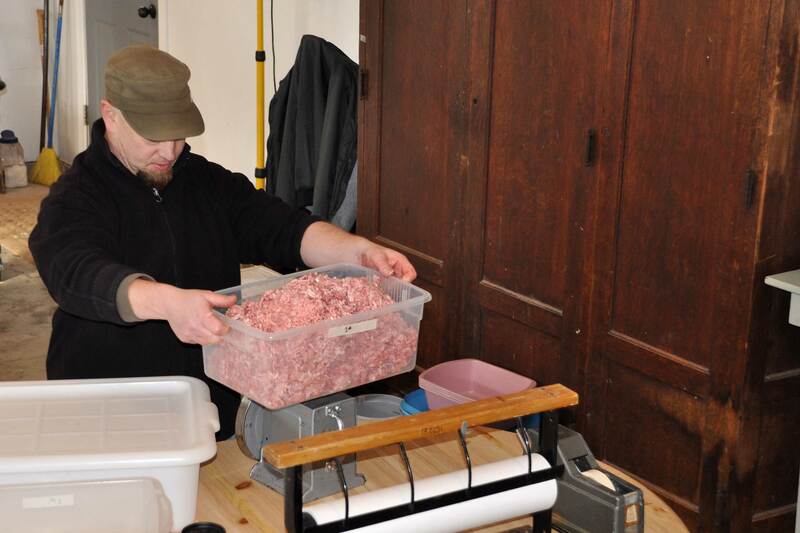 The grand total for the pork sausage this year was around 300 pounds – 10 of the 30 pound batches. Of that 300 pounds of sausage, we wrapped about 120 pounds into 1 pound packages of bulk sausage. The remaining bulk sausage is processed into links. I find this part of the process…ummm…interesting. Mostly because of the use of hog intestines. The vessel for stuffing the sausage is hog casings, the intestines of the hog. They are removed during the butchering process, rinsed and packed in salt. We purchase the casings from the meat locker where we get the hogs. My daughter and mother-in-law have the job each year of giving these casings another rinse before they are used. After the casings are double-rinsed for good measure, they are put on the stuffer. With one person turning the crank and the other holding the casings, the bulk sausage is stuffed into the casings. The sausage links are then weighed for record-keeping and to help figure out the amount available for distribution to all the workers. The total link pork sausage processed this year was 200 pounds. 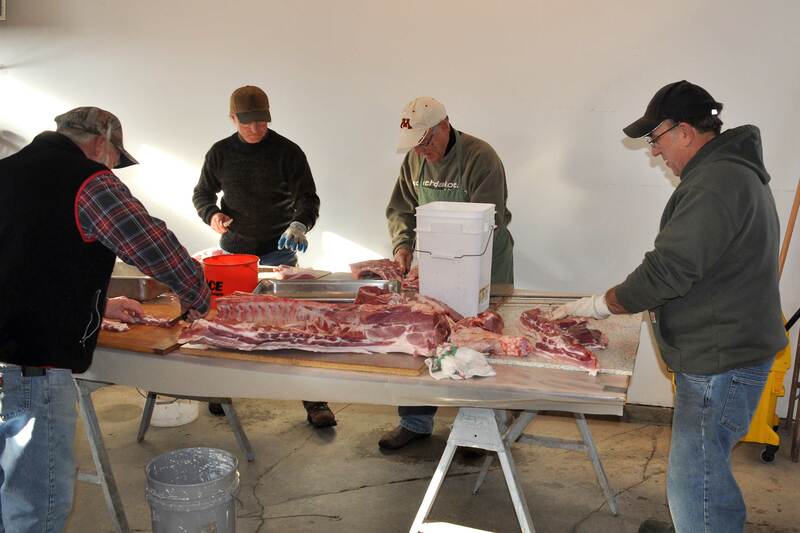 Once all the pork is ground up and mixed, the crew starts cutting up any venison that we have for the year. This year we had about 60 pounds of venison. 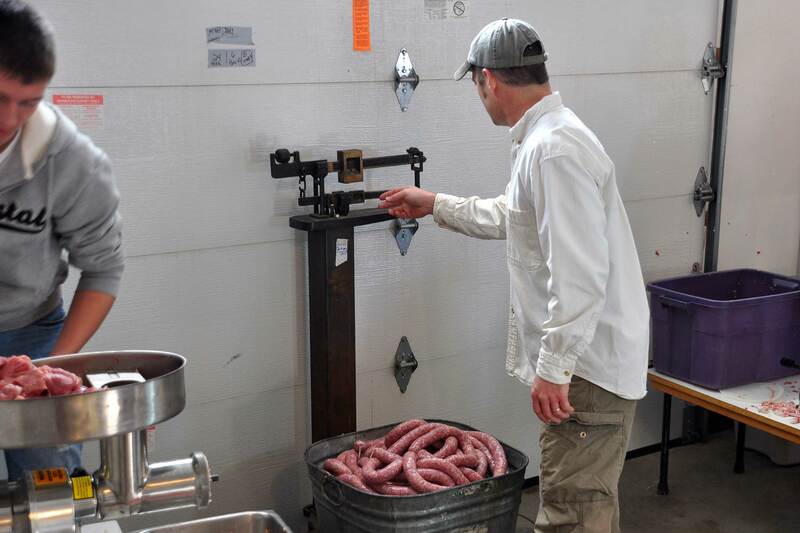 The venison sausage is also mixed in 30 pound batches, with 20 pounds of venison and 10 pounds of pork trimmings. The rest of the process is the same as the pork, even the spices used. We make all of the venison into link sausage. The last step in processing the link sausage is cold-smoking. 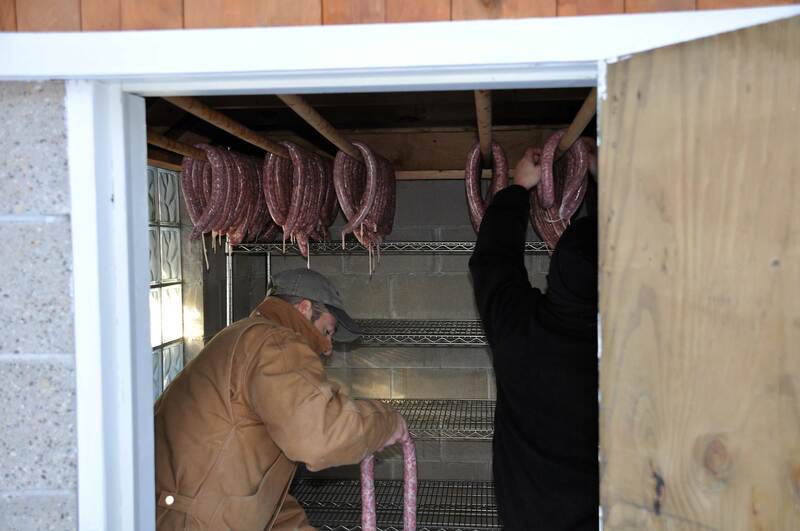 This family tradition of making sausage is the primary reason Jesse decided to build our smokehouse. Interestingly, my post on building our smokehouse is the primary search term that brings people to my blog. 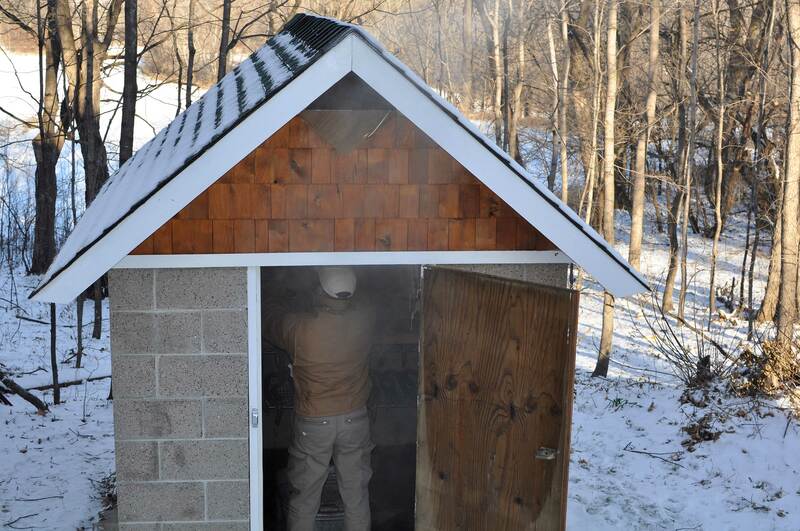 If you are interested in building a smokehouse, check out the post here. 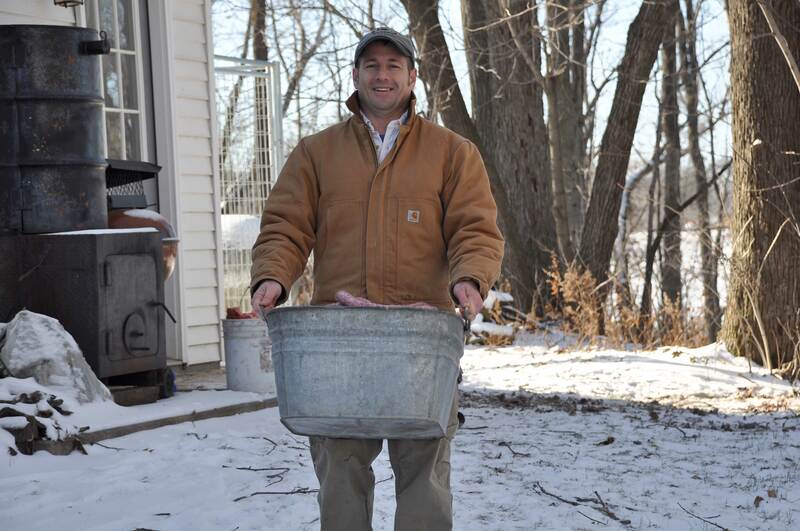 The 300 pounds of link sausage is carried tub-by-tub out to the smokehouse and placed on racks for drying. 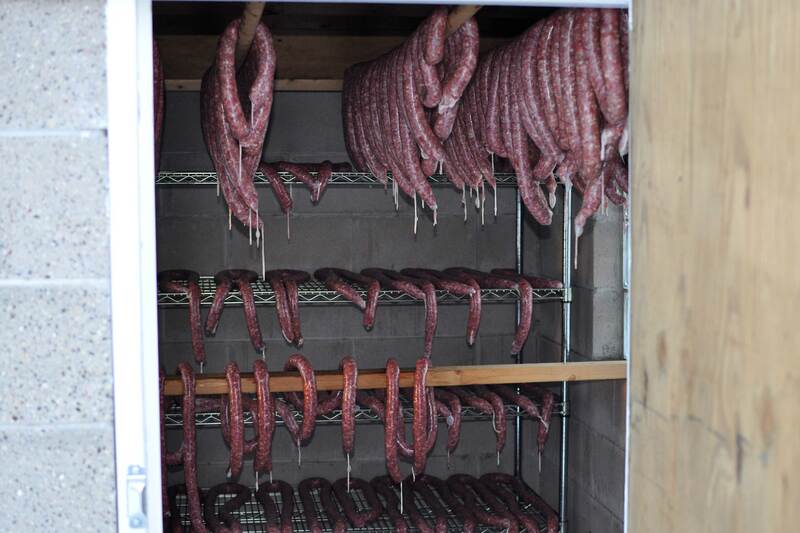 The sausage is hung in the smokehouse to dry overnight to form a pellicle. The pellicle refers to the tacky surface that develops when food is dried and to which the smoke sticks, thereby adding the desired smokey flavor. Early the next morning, Jesse fired up the smokehouse to start the cold-smoking process. The art of cold-smoking is to keep the meat below 70 degrees F to inhibit bacteria growth and to not cook the meat. (Refer to this post about building our smokehouse for more information on how our smokehouse works). After about 5 hours of gentle cold-smoking, the link sausage is finally finished and ready for wrapping. A work crew assembles once more to cut the links into 1 pound servings for packaging in freezer paper. We divide the sausage between the various individuals and families according to their preference ratios of bulk versus link. So, after a few long days of hard work and good company we are done making sausage for the year. In addition to the great family memories we create each year through this tradition, we get to enjoy some amazing sausage over the next 12 months. 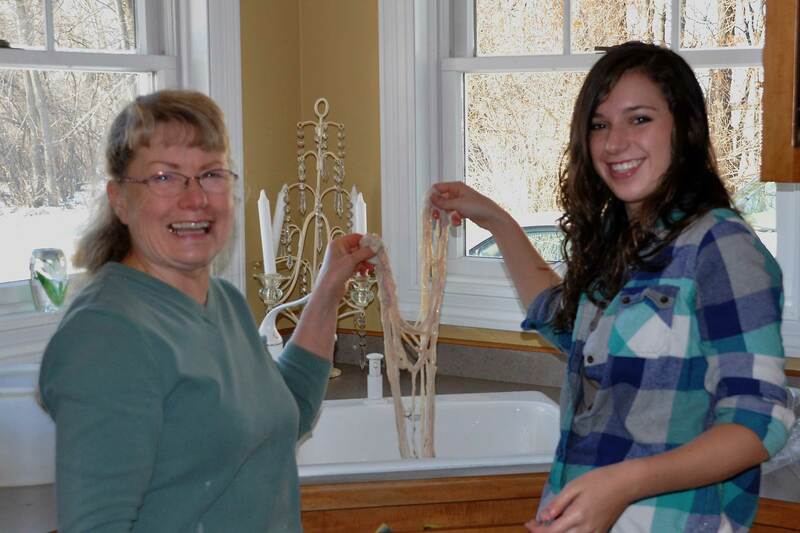 Does anyone else make sausage as part of a family tradition? Please share your stories in the comments! I truly enjoyed reading your story and seeing your pictures. My husband and I also sold out from the city and bought us a hobby farm. We both also grew up as children on a farm. I would like to build a smokehouse but my husband is not found of the stores “smoke” flavors on meats. I was just wondering if you could tell me if they was any comparison? I’m sure yours taste a lot better but I need to let him know how much of difference the taste are so I could talk him into maybe building us one. I like some of the smoke flavors but he doesn’t. So maybe you could write me back and let me know something if you don’t care. We always raise and process our meats. I thought about trying your families spices next time if you don’t mind. We were always used to salt cured meats. I don’t rememeber my granny having a smoke smokehouse. Her’s had a floor in it and a big table in the center. All along the walls were also counters. They always hung their meats on hooks and hung them from the rafters. I would also like to know how they sugar cured meats too. I have no idea how to find out that stuff or where they sell it anymore. Your interests seems similar to ours, but we don’t know how to do it ourselves. I would like to learn how though. It’s been nice chating with you though. Have a good day and God Bless. Hi Kim! I don’t really know how to describe the difference except that it just tastes more “fresh” and really doesn’t compare. You can start with something much, much smaller than our smokehouse. In fact, my husband also has a small electric hot-smoker that makes some fantastic ribs, smoked pork tenderloin, etc. The smoking doesn’t cure the meat like a salt or sugar cure does however, it just adds flavor. I’ve never actually even heard of sugar curing…sounds interesting. Good luck on talking your husband into trying out smoking food and thanks for stopping by! There is a lot of variation in smoke flavors depending on what type of wood is used and how long it is smoked. I should also warn you that many grocery store foods are smoke flavored with chemicals and not actual smoke – yuck! If your husband prefers a milder smoke flavor then I would recommend using fruit tree woods and starting with smoke times of about 1 to 2 hours, and then increase from there if it is not too strong. Excellent post, well described technique that in principle the same everywhere. in Russia we all do exactly the same, only the composition of sausages, which is more pork, more beef somewhere. Thanks for visiting our site and glad you enjoy it. Your question regarding dried sausages like pepperoni and salami is a good one. Dried sausages are the most difficult, challenging, and a little risky due to the potential for botulism as the meat is never cooked. I have to admit that I have not yet attempted these types of meats as there is still so much to learn and experiment with in the areas of cold and hot smoking. I would recommend that you purchase the book “Charcuterie – the craft of salting, smoking and curing” by Michael Ruhlman and Brian Polcyn, it is an excellent read and one of my primary resources – I just wish they had more high quality photos. Good luck. Would really like the recipe ? We have to hogs that we are going to do in February and I can’t find a recipe that I like? How do you enjoy it over the next 12 months? I thought frozen sausage had to be eaten within the next couple of months. Hi there! I’m about to purchase a whole hog and am not fond of the fresh ham (I do not have access to smoking or curing). I assume it would be ok to keep out the cuts I want such as chops, a couple roasts, spare ribs, and grind the rest into bulk sausage? Bacterial life “begins at 40” F, Do y’all use cure in your cold-smoked rope? Bob Evans always advertised using hams and loins in his whole-hog sausage, but didn’t tell people that they ground only sows. Young sows, or a gilt that failed to breed, would be a good choice. Normal store-bought spices can carry a bacterial load, I boil spices then chill them prior to making sausage. Salt is a mineral as well as a seasoning; using purified salt is a best practice. Loved your family tradition. Home-harvest, in outdoor temps between 28 and 40, is also worthwhile. Liquid smoke is a by-product of hardwood charcoal production. Check out porkandbeefexpress.com for more meat processing info. Sorry if I’m over replying. Salt increases fat oxidation; which can be experienced as freezer burn or warmed-over-flavor. Cure inhibits oxidation, but also adds characteristic color and flavor. Sausage sodium phosphate inhibits oxidation and increases cooked product moisture retention. The longer raw product is held in freezer storage, the more food-grade sodium phosphate makes sense.